YOU Are A Universal Bridge of Grace! - A Most Timely Master Activation Series - a nine-part webinar series. The entire Master Activation series encourages greater balance, and so it is most appropriate to begin building our Bridges of Grace by strengthening and balancing our personal energy dynamics of giving and receiving. This free session will set in motion a powerful and elegant pattern of energies radiating horizontally from the core of your beings, signifying your acknowledgement and participation in the beginning of this new cycle to bring about a Golden Age of grace and nurturing. This webinar series is presented in nine 90-minute segments (live or recorded). YOU Are A Universal Bridge of Grace! If you choose to participate in all 9 sessions of the series, you will receive a Certificate of Recognition as a Master Activator of the energy of YOU Are A Universal Bridge of Grace! Balancing the Universal Bridges of Grace, Phoenix Style! This Energy Session Event is for all of us: a gift of welcome to the beginning of a new cycle, a Golden Age of reconstruction filled with the energy of Grace! This is now a time for us to bridge the gap in the energies that occurs when one cycle ends and a new one begins. In this free energy event, personally and collectively we will strengthen our abilities to generate and channel the energy and light that will support us to evolve as Universal Bridges of Grace. Many prophecies have foretold of a time of global disaster or destruction. Gratefully, with worldwide consciousness awakening we have evolved enough to change the potential outcome of those predictions. Of course, there have also been prophecies of a Golden Age, a time of peace and nurturing. This reality will not simply happen in one day, and so we continue to do our part by taking another step in the Great Evolution to accelerate the transformation already in progress! Let us wholeheartedly embrace our abilities TO BE the bridges of grace we are capable of becoming. Doing this in a supportive community, with others who are wholeheartedly committed to this transformation, strengthens the energy and light exponentially. There are enough of us here to make a significant difference in raising the frequency of energetic awareness for now and future generations. I was happy to discover the energy patterns in this session are for balancing our personal and unique energy dynamics of giving and receiving. I suspect working with these patterns will bring happiness to you too! The entire Master Activation series encourages greater balance, and so it is most appropriate to begin building our Bridges of Grace by strengthening and balancing our personal energy dynamics of giving and receiving. This free session will set in motion a powerful and elegant pattern of energies radiating horizontally from the core of your beings, signifying your acknowledgement and participation in the beginning of this new cycle to bring about a Golden Age of grace and nurturing. As in any session we do together, we co-create patterns of energy, side by side, heart to heart, in the Universal Field beyond time and space. In this new cycle of increasingly loving energy and light, being who you are and working together in authenticity are key elements of success. The evolutionary theme remains: We are Unique and we are United! What will YOU receive in this series? You will receive specific activations and alignments to accelerate your personal growth and the expression of your most benevolent energies … YOU Are A Universal Bridge of Grace! The activations and alignments are designed to accelerate and recognize the occurrence of synchronistic connections that are so important to make now, with other Universal Bridges of Grace. In our time together, you will experience and embody more of the golden energy of YOU, the Universal Bridge of Grace you are. These are all important steps along your path of personal growth, enhancing your ability to live life energetically aware. What energetic tools will YOU learn to work with in this series? To further enhance your personal growth, you will learn how to transmit the activations of YOU Are A Universal Bridge of Grace! to others - family, friends, or clients - who want to increase their personal expression of what it means to live in this most benevolent state of grace. And in addition to transmitting, you will also receive specific alignments enabling you to teach others to transmit the activations. Students that you teach will receive a certificate as Activators of YOU Are A Universal Bridge of Grace! even if YOU are your only student, participating in these sessions will accelerate your ability to communicate within yourself and with others in the language of energy. These are Phoenix Style energy tools, complete with clear instructions - profound to use and easy to transmit. Experience and Co-Create! Initial Activation for YOU. If you are reading this, you are ready to open and increase the energetic flow of grace that comes from deep within wise, wholehearted, multidimensional you! In this initial energy session, you will define and experience the resonance of grace that radiates within every cell of your body, every layer of your DNA, every light fiber of your being. The radiant golden glow of this resonance illuminates and nurtures as you discover more of who you are. In the light of this energetic flow you begin to build foundations for yourself as a strong Universal Bridge of Grace, more capable of making a difference for peace and unity in the golden age of the Great Evolution. In this session we initiate and co-create the first energy patterns of this activation … a most creative and exciting part of this work! Transmit! Activation for YOU and others. In Session 2, the activation becomes stronger within you, to support you in your personal expression as a Universal Bridge of Grace. Based on the energy patterns we generated in Session 1, the activation has been calibrated to its next highest order of coherence. You will receive the complete written version of the “Grace Within YOU Let It Flow, Let It Glow!” activation. In this session you will also receive energy alignments to increase the resonance of Grace within you, to enable you to clearly and simply transmit the “Grace Within YOU Let It Flow, Let It Glow!” activation to others, including friends and family as a gift, or as an additional professional service you offer to clients in your practice. This is a “Phoenix Style” energy tool, easy to do and profound in its effect. You will also receive a downloadable document with simple, clear instructions for transmitting this activation to others. Teach! Activations and Alignments for YOU and others. In this most loving and honoring session, we will activate the alignments and make the final calibrations to support you in your unique expression as a Universal Bridge of Grace. This session will also enable you to clearly and simply teach the “Grace Within YOU Let It Flow, Let It Glow!” activation to others. Those you teach will then be able to transmit this activation to others, including their friends and family as a gift, or as an additional professional service to their clients in their practice. You will also receive a downloadable document with the complete instructions for the alignments, just as Peggy transmitted them to you, and you will use them to teach this activation. In this time of the Great Evolution, you are both student and teacher at the same time. Even if you are your only student, participating in these sessions will accelerate your ability to communicate within yourself and with others in the language of energy. The energetic language of these activations and alignments are the way we communicate in these energy events. It truly works! In the collective consciousness, one cycle is ending and another cycle is beginning, a Golden Age of the Great Evolution is dawning. The energies of co-creation for building Universal Bridges of Grace with others are ready to be amplified during this time of transition between the two cycles. You will be contributing more to the growing collective awakening, and amplifying personal relationships grounded in the energy of Grace. As you continue to evolve and resonate as a Universal Bridge of Grace, your very presence will inspire your family of humanity to remember that they too are Universal Bridges of Grace. You will radiate the energy to attract or “call” others to you who are building Universal Bridges of Grace. You will also develop the ability to answer the “call” from other Bridge Builders, in unity you become more powerful co-creators! You will bridge the cycles through the Universal Field with more synchronicity, more light, more energy, more grace, and this is very good for all of us. In Session 5, the activation becomes stronger in support of your personal growth and expression as a Universal Bridge of Grace. Based on the energy patterns we initiated and generated in Session 4, the activation recalibrates to its next highest order of coherence. 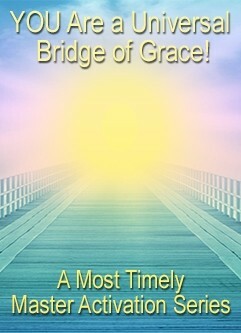 You will receive the complete written version of the “Calling All Universal Bridges of Grace!” activation. In this session you will also receive energy alignments to increase the resonance of Grace within you. You will then be able to clearly and simply transmit the “Calling All Universal Bridges of Grace!” activation to others, including friends and family as a gift, or as an additional professional service you offer to clients in your practice. This is a “Phoenix Style” energy tool, easy to do and profound in its effect. You will also receive a downloadable document with simple clear instructions for transmitting this activation to others. In this most loving and honoring session, we will activate the alignments and make the final calibrations to support you in your unique personal expression as a Universal Bridge of Grace. In the Great Evolution, you are both student and teacher at the same time. Even if you are your only student, participating in these sessions will accelerate your ability to communicate within yourself and with others in the language of energy. The energetic language of these activations and alignments are the way we communicate in these energy events. It truly works! This session enables you to clearly and simply teach the “Calling All Universal Bridges of Grace!” activation to others. Those you teach will then be able to transmit this activation to others, including their friends and family as a gift, or as an additional professional service to their clients in their practice. This part of the activation is offered in respect and honor to Gaia, our beautiful, life filled planet earth. There is an abundance of work to be done in a never ending effort to care for our planet and all life here. Continuing to strengthen and enhance your presence as a Universal Bridge of Grace, you walk the earth in the golden resonance of Grace generated between you and Gaia. This energy interchange supports growing awareness within the collective consciousness for the higher degree of co-operation now possible as we enter the Golden Age of the Great Evolution. In the resonance of Universal Bridges of Grace, the term “networking” takes on a powerful new meaning as the visionaries of this world come together with greater ease … unique and united has just gone quantum! In Session 8, the activation becomes stronger in support of your personal growth and expression as a Universal Bridge of Grace. Based on the energy patterns we initiated and generated in Session 7, the activation recalibrates to its next highest order of coherence. You will receive the complete written version of the “Grace For Our Earth & All Life!” activation. In this session you will also receive energy alignments to increase the resonance of Grace within you. You will then be able to clearly and simply transmit the “Grace For Our Earth & All Life!” activation to others, including friends and family as a gift, or as an additional professional service you offer to clients in your practice. This is a “Phoenix Style” energy tool, easy to do and profound in its effect. This session enables you to clearly and simply teach the “Grace For Our Earth & All Life!” activation to others. Those you teach will then be able to transmit this activation to others, including their friends and family as a gift, or as an additional professional service to their clients in their practice. Can't make it live, register anyway and receive the recording!